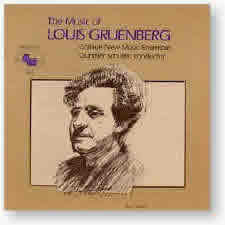 From perhaps the greatest recent American composer to have fallen into obscurity, the music of Louis Gruenberg (1884-1964) ignited the second quarter of this century with its bold blending of European traditions and uniquely American strains of jazz. Several of Gruenberg’s most important works are collected here in superb performances by New England’s prestigious new music ensemble, Collage. Gunther Schuller conducts. Recorded in (#1) February 1985 at the First and Second Church in Boston, Massachusetts, and (#2-13) June 1985 at Brown Hall in Boston, Massachusetts.